The Andrew W. Mellon Foundation has awarded Emory $1.5 million over five years to expand professional competencies and integrate public scholarship into humanities doctoral training, as well as graduate teaching and research endeavors, at the Laney Graduate School. The Andrew W. Mellon Foundation has awarded Emory University $1.5 million over five years to expand professional competencies and integrate public scholarship into humanities doctoral training, as well as graduate teaching and research endeavors, at the Laney Graduate School (LGS). The “Mellon Humanities PhD Interventions Project” will be led by principal investigator Lisa Tedesco, dean of the Laney Graduate School and Emory's vice provost for academic affairs for graduate studies. “This project will help us support work with faculty and graduate students to shape and refine how we provide professional development and career planning resources for the most contemporary preparation of humanities doctoral students," Tedesco says. A particularly important part of the project is its emphasis on support for graduate faculty and graduate students to be change-makers in their programs and curriculum. “To date, a lot of our career planning work has been added and offered by LGS, organized and administered with input and guidance from a committee of graduate students and some faculty," Tedesco says. "We are gaining traction and seeing success, but we are also facing the next challenge." That challenge, from her perspective, is cultural. “Student participation in LGS career planning programming is mostly by self-selection as they progress through graduate programs that are structured to guide them to traditional faculty careers," Tedesco explains. "The challenge here, as recently noted in the Mellon commissioned report Reforming Doctoral Education, 1990-2015: Recent Initiatives and Future Prospects, is that many humanities students, intentionally or unintentionally, do not go on to tenure-track positions at research universities. “We believe that more direct involvement of faculty is needed with support for change and innovation — change to the culture of graduate training in the humanities as it relates to professional development and support for the change-makers as they reimagine the scope of graduate training and career preparation,” she says. Under the leadership of a faculty director and advisory committee, LGS will offer Graduate Faculty Curriculum Development Grants to faculty for changes to graduate courses. The aim of these grants is to integrate public humanities scholarship and assignments that develop new competencies into existing or new courses open to humanities students from multiple programs. 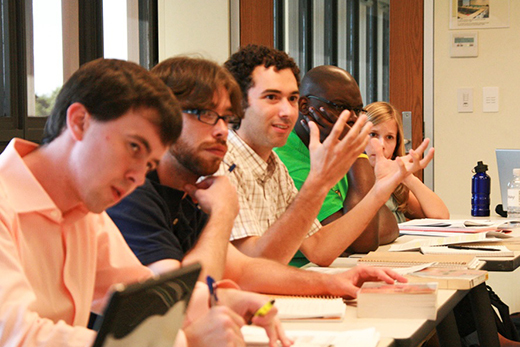 LGS will also invite doctoral program leadership to apply for cross-program two-year PhD Program Intervention Grants to address two or more challenges outlined in Mellon’s Reforming Doctoral Education report. Student Intervention Grants will provide funding and fellowships to support student engagement and exploration of public scholarship, innovative teaching and non-academic career pathways. And finally, Humanities Interventions Programming will support the activities of faculty and student grant recipients by convening campus events to share and reflect on the innovation activities, their integration and sustainability with the broader humanities community, and to share with other interested members of the Emory University community. The Andrew W. Mellon Foundation also sees the potential of this project to serve as a national model of innovation in humanities doctoral training and career preparation. “The Laney Graduate School PhD Interventions Project promises to reimagine elements of doctoral training in the humanities in ways that will better prepare students to address contemporary problems through humanistic lenses, and, as importantly, to do so in ways that will be accessible to the broader public,” says Cristle Collins Judd, senior program officer at the Mellon Foundation. As the project moves forward, it has the support of Emory Interim Provost and Executive Vice President Stuart Zola.